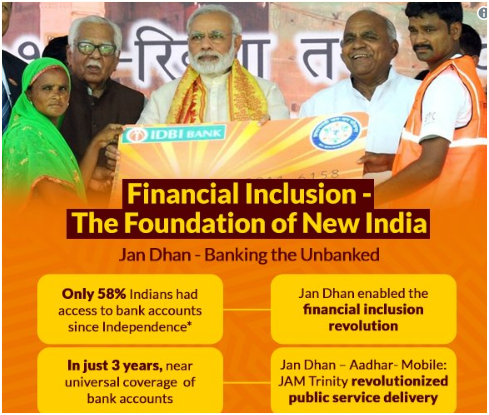 The Prime Minister, Shri Narendra Modi, on the completion of three years of the Jan Dhan Yojana, has congratulated all the beneficiaries of this historic financial inclusion initiative. “Today, Jan Dhan Yojana completes 3 years. I congratulate the crores of people, particularly the poor, who benefitted from this initiative. Jan Dhan Revolution is a historic movement to bring the poor, downtrodden and marginalised into the financial mainstream. Through Jan Dhan Yojana, social security schemes, MUDRA & Stand-Up India, we have given wings to millions of aspirations. Our efforts to bring a qualitative and transformative change in the lives of the poor and marginalised continue with immense vigour”, the Prime Minister said.